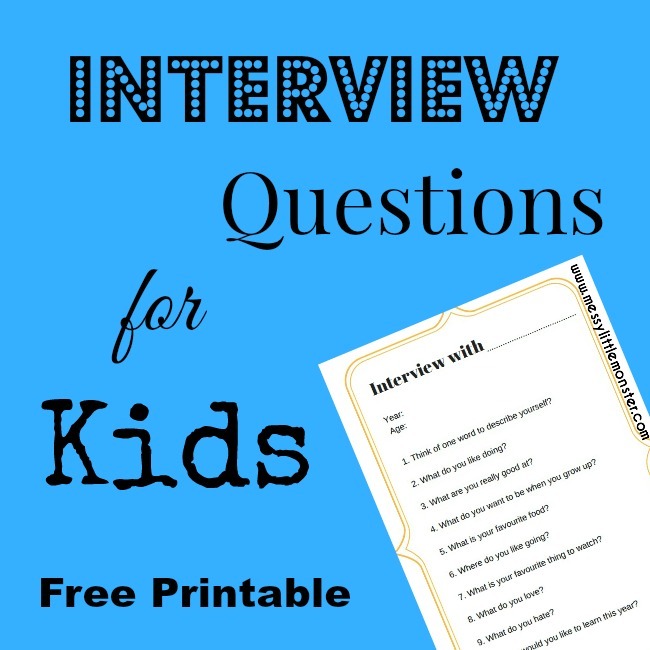 Start a New Years tradition with the kids this year with some printable interview questions. Record a few memories with these New Years interview questions for kids and look back on them year after year! Simply download our free set of kids interview questions and record your child's answers, or even better video them answering each question! Interviewing your child by asking them few fun questions is a nice way to start the New Year. (see all our New Years Eve activities for kids here) You might even find out something new or unexpected about your child! Alternatively interviewing your child each year on their birthday would be fun! Whether you film your children answering these questions or you write down their answers they will create a great memory, especially if the questions are repeated year after year. Older children could even fill out the interview questions themselves. If you are looking for more fun New Years Eve activities for kids take a look at our New Years Eve party blowers, firework craft and our New Years Eve memory jar. Can you think of one word to describe yourself? Where do you like going? What is your favourite thing to watch? To get these interview questions for FREE type in $0 and click on the 'I want this' box below. It may take a moment for the page to load so please be patient. For personal use only. Not for redistribution. All images are copyrighted. Thank you. We hope that you enjoy using these printable interview questions for kids. If you are looking for New Years Eve activities for kids this is a good one to add to the list!